Never lived in a foreign country so I can't really relate. But I would like to try! Not all Americans make this mistake. Mm, I'd say everyone assumes the surface things to be different, of course. But even if you're prepared to eat different food or watch out for different social customs, the difference in values and the way other cultures think about things can really throw you. Not even surface things; I know people who were quite surprised and even upset when they could not find their favorite brand of ketchup in another country or the cheese they were used to, and had it shipped for them from home. Not only Americans, when I lived in the USA the British expat community would get their family to smuggle all kinds over, usually Cadbury's chocolate or Marmite (to be fair, American chocolate pales in comparison). But overall is this not why we have multiculturalism? In the UK I love fish and chips and roast beef and pubs but I also love curry houses and Polski Skleps and shisha bars. People always ask me what I miss from my home country, and I have never been able to answer, since every country I've lived has had so many other things to offer. But then again, there are certainly some things in every country I've lived that I don't miss. I guess those are mostly the value issues mentioned in the current strip. Interesting. I haven't lived outside of the country yet, so I would love to hear any examples of this that y'all are willing to share. LOL!! This is great! 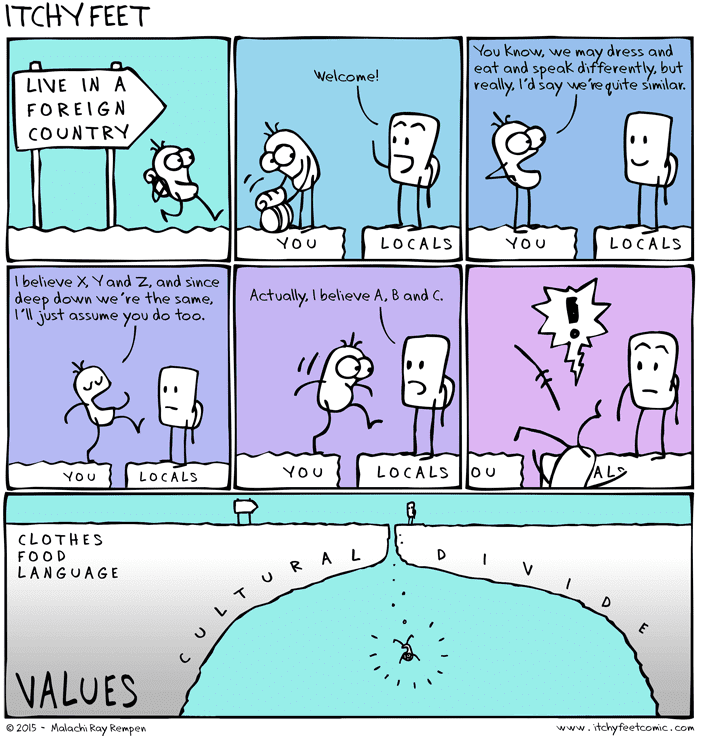 Being married to someone from a different culture, we've experienced this both ways as well.